With the Elimination Rounds complete, 12 anglers have moved forward into the Sudden Death Rounds of the Jack Link’s Major League Fishing 2013 GEICO Challenge Cup. Having earned their way through to the second phase of this event is a blessing, and a curse. The blessing is they are now one step closer to the finals, and the chance to become a Major League Fishing Champion. The curse comes from the fact that the pressure in the semifinal round ratchets up a notch or two thanks to the Sudden Death Semifinal format. The qualifiers in the Elimination Rounds are decided by total weight at the end of a full day of fishing. The Sudden Death Semifinal format is a race to a pre-determined qualifying weight called a cutline. When three anglers reach that weight, the day is over, three move on to the final and three go home. The Sudden Death cutline weight is determined by averaging the second place weights from the three Elimination Rounds. Once that weight is established, it becomes an all out sprint with a higher level of pressure. The anglers that competed in the first of two Sudden Death Rounds were Tommy Biffle, Brent Ehrler, Gary Klein, Bobby Lane, Ish Monroe and Takahiro Omori. One look at this group and it isn't hard to see that the field’s primary strengths revolve around shallow cover, and a flippin' rod. However, as we've learned in Major League Fishing competitions of the past, nothing can be taken for granted. While the anglers had to focus on reaching the 20-pound cutline, they also had to keep a wary eye to the east, as tropical storm Sandy. With strong winds, the first day of Sudden Death was an interesting day. Following their 15 minute scouting period, the anglers settled into their fishing holes with five of the competitors on the eastern side of the zone, while the lone Floridian remaining in the field, Lane, chose to target the opposite side. It made people began to wonder if he knew something the rest of the field did not. It took six minutes for Biffle to make the first appearance on the leader board with a 1-pound, 4-ounce keeper he caught in the only creek in Zone Two. It took more than 30 minutes before for another angler to post a keeper, and at 8:24 a.m. local time, Monroe finally connected his floating frog with a 3-pound, 3-ounce keeper. Over the next several minutes, Monroe and Ehrler both posted keeper fish to the leader board, with Ehrler taking the early advantage, largely in part from a 4-pound, 10-ounce largemouth. Six minutes after Ehrler boated his kicker, Omori sent the whole field reeling when he posted a 7-pound, 6-ounce behemoth to the leader board to instantly make himself a contender. Monroe followed moments later with a 5-pound, 2-ounce kicker of his own. 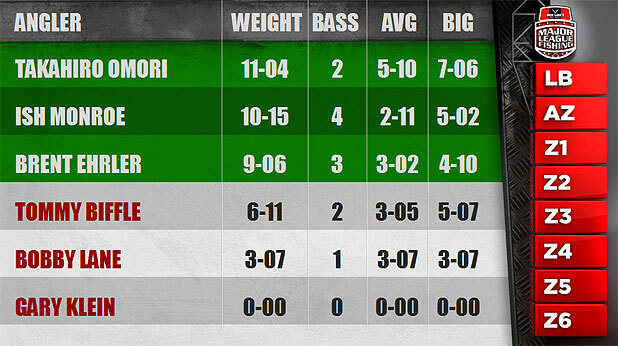 Omori soon followed up with another solid bass weighing three-plus pounds, along with Biffle with a 5-pound, 7-ounce kicker. Lane soon followed with his his first keeper, while Monroe and Ehrler continued to add to their total weight before time expired. When the dust settled on what would become the best big fish producing period in Major League Fishing history, Omori's two fish put him in the lead with 11 pounds, 4 ounces. He was followed closely by Monroe, who posted four keepers for 10 pounds, 15 ounces. Ehrler's 9 pounds, 6 ounces, put him in third place, Biffle in fourth with 6 pounds, 11 ounces, Lane in fifth with 3 pounds, 7 ounces, and Klein had yet to land a keeper. More importantly, two anglers were already halfway to the 20-pound cutline weight. The mood at the first break was intense. The mood didn't lighten for the field much after the second period started. That is with the exception of Klein, who put two small keepers on the board in the first 15 minutes of fishing. Sandwiched in between those two small fish was another score by Ehrler, which seemed to dial in a pattern he could run with. Monroe answered at 11:28 a.m. with a 3-pound, 2-ounce chunk. Both Biffle and Monroe posted keepers over the next several moments. Then, at 11:57, 20 minutes after Monroe landed a keeper, the tide turned towards Ehrler. The 2012 Challenge Cup Champion posted three consecutive fish to bring him within striking distance of the 20-pound cutline. Biffle and Omori each posted a pair of keepers, followed by Monroe with another one of his own, but at 12:46 p.m., Ehrler struck again, putting him within a pound of cutline. Lane produced one over three pounds, but then Ehrler struck the death knell at 1:06 when he boated a three pounder to make him the first qualifier for the finals. His final weight for the day was 22 pounds, 9 ounces. As Ehrler was doing his postgame interviews with the editorial staff and reporter Marty Stone, the rest of the field was beginning to take shape. Monroe was sitting in second with 17 pounds, 9 ounces, Omori third at 13 pounds, 5 ounces, Biffle fourth with 11 pounds, 5 ounces, Lane with 7 pounds even and Klein with 1 pound, 10 ounces. 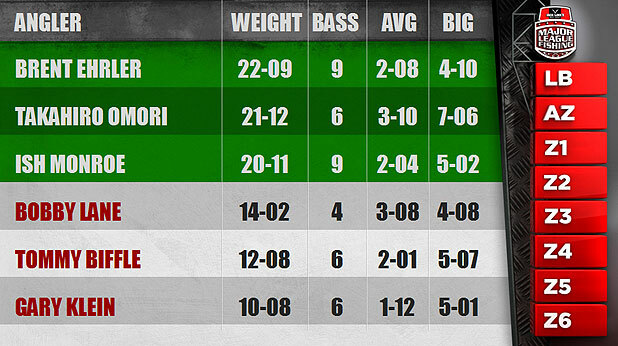 With one angler already on the trailer, and Monroe within one bite of following suit, it appeared that the only real battle would be for the third person to eclipse the goal weight. But, as he had already shown, Omori made everyone stand up and take notice again, when he made a quick move five minutes after the third period began. His first flip into an isolated mat produced a 6-pound, 4-ounce giant, which reminded anglers of the power of Florida fishing. With Omori quickly taking control of the second qualifying spot, Monroe began to struggle, while the rest of field began to step on the accelerator. Klein kicked it into gear with two fish, including a five pounder. Then when Lane caught one over four pounds, everything began to look more interesting. Then at 2:47, Omori punched his ticket to the finals, when landed a two-pounder that pushed him over the 20-pound mark. With only one finals qualifying spot remaining, Lane produced another fish close to three pounds, then Monroe finally broke his nearly two-hour drought with a small keeper. Biffle and Klein ended up scoring again, but was too little, too late. Monroe nailed a 2-pound, 4-ounce fish to put him over the cutline, sending him to the finals with the third and last ticket to the finals. That left Biffle, Klein and Lane to wonder what they could have done differently to reverse the roles. But, with that, the first three finalists into the championship round of Jack Links Major League Fishing 2013 GEICO Challenge Cup have been decided.